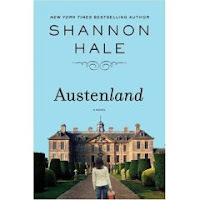 Austenland by Shannon Hale. Reviewed from ARC; copy from ALA Midwinter 2007. Publication date June 2007. The Plot: Jane Hayes is in love with Mr. Darcy. Not just any Mr. Darcy; but the BBC Pride & Prejudice Colin Firth Mr. Darcy. Yes, we all know how that is. But it's just a fantasy; until her great-aunt gives her a very unique gift. A trip to England. To Pembroke Park. Where you get to dress up and act as if it's Regency England (well, Regency England with modern plumbing). Jane goes determined to use this trip to conquer her Mr. Darcy fantasy; but will total immersion just make the fantasy more real? The thing is -- everyone is either an actor (or actress) playing a role, or someone paying money to live the ultimate fantasy. Who to trust? Who to believe? In this land of manners and make believe, Jane discovers who she really is. OK, let's be blunt. If you own the DVD version of the Colin Firth Pride and Prejudice, this book is for you. And if you loved the Bridget Jones movies, this book is for you. (Not to give too much away, but there is a scene where two men fight over Jane that is awesome. ) This book is a pure joy. Oh, and if you're wondering how well Hale captures Austen's tone and voice in telling this story, here are the opening sentences: "It is a truth universally acknowledged that a thirty-something woman in possession of a satisfying career and fabulous hairdo must be in want of very little, and Jane Hayes, pretty enough and clever enough, was certainly thought to have little to distress her. There was no husband, but those weren't necessary anymore. There were boyfriends, and if they came and went in a regular stream of mutual dissatisfaction -- well, that was the way of things, wasn't it?" *Don't try googling to find the "real" Pembroke Park. Doesn't exist. But I think it would be cool if the author or publisher put up a fake website for it! ** But not in a WestWorld way. Hm, doesn't seem like there are any new historical reality shows being filmed; if you know of one, let me know! Oh good ! It's out in late May. Will pester the library to get a copy... (I loved Shannon's River Secrets which was a Cybils SF&F longlisted book). Oh, but Matthew MacFadyen in the 2005 version was 1000 times better. Will I be able to relate if I am in love with that Mr. Darcy? Michele, I think you'll enjoy! Anon, true confessions: I also loved the Macfadyen version. I aodred Matthew in MI-5/Spooks, and while his P&P was different from the BBC, I still LOVED it. A different spin, plus sometimes? I only have a couple of hours. Austenland makes much of Colin Firth, but it doesn't slam the MadFadyen version. If you've wished yourself back to that time period...you'll love it!